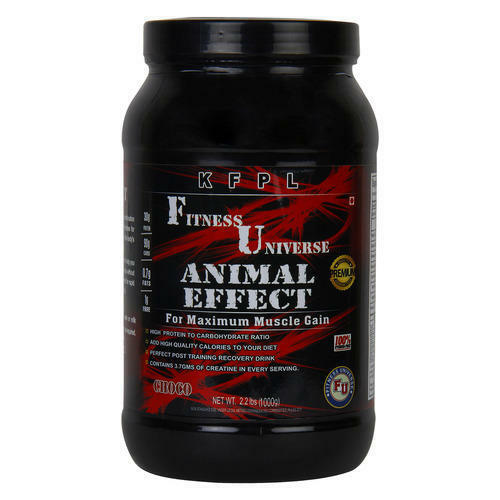 We are a unique name in the industry to provide our precious clients an exclusive range of Fitness Universe Animal Effect supplement 2.2 lbs supplement. Offered choco supplement is exclusively processed at vendor's end using the optimum grade ingredients, chemical compounds and modern technology in synchronization with the set Medical industry standards. Owing to its accurate composition and zero side effects, this choco supplement is very popular among our clients. Incorporated in the year 2013 and approved by FSSAI, in Jammu (Jammu and Kashmir). We “Kerni Fitness Private Limited ” are renowned trader, importer, exporter and supplier of a qualitative array of Fitness Universe Range of Supplements. All our products are obtained from the reliable and licensed vendors of the industry. Under the supervision of our vendor's experts, these supplements are processed using best quality chemical compounds and advanced technology as per the set quality standards. These are known for their accurate composition, effectiveness, purity, long shelf life, hygienically packed and safe usage. Apart from this, we are also providing FU Double Compartment Shakers and other Fitness related accessories to our clients. These accessories are manufactured and designed by our vendors using high quality material and latest technology at their well-furnished infrastructural unit.